e.g. 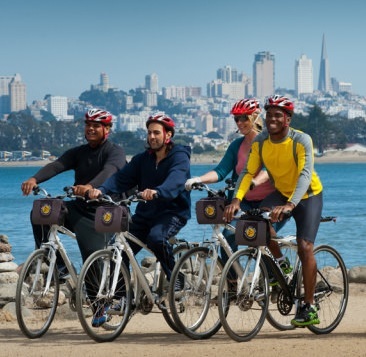 bike rentals, sightseeing tour, dining discount. We feature a fleet of 1,000+ bicycles; from standard Comfort Hybrids, Performance Bikes and Tandems, to Electric, Kids and Road Bikes. With each rental we include a map, route advice, helmets, bike storage and rear gear racks. 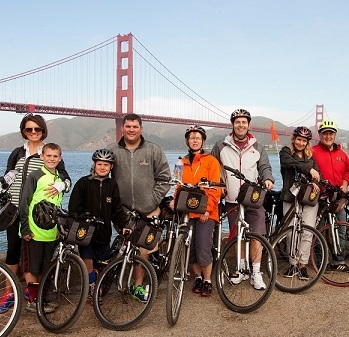 We give you the option to comfortably and safely experience San Francisco like a true native. Guests can indulge in the road less traveled and the exciting “underground” routes through this spectacular city offers using our custom, high quality maps that detailing rides for all levels of riders and interests. In addition to self-guided rentals, we feature four Daily Guided Tours led by expertly trained guides. These tours take guests over the Golden Gate Bridge to Sausalito, around the city on a custom urban tour, and through the historic backroads of the Presidio- respectively. The guides strive to provide an excellent experience for guests, with safety and fun as the objectives of each tour. Our Tour Guides retain the freedom to personalize their tours with their personality and to cater to their riders’ needs – if riders are experienced the tour can be embellished; if riders are novice the tour can slow it down a bit. Bottom line- no two tours are alike. 2661 Taylor Street, between North Point & Beach Street. 1325 Columbus Street, Between Beach St & North Point St.
All rights reserved. No use of images or text without written permission. For more information see About Us page. Copyright © 2019 | MapWest Publications Inc.